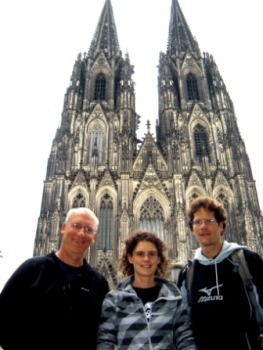 We had met friends, Alex & Henno from Cologne, last fall in France. 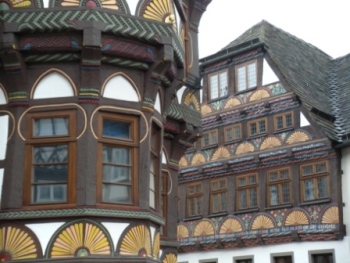 They invited us to their city and we enjoyed a lovely evening with them. 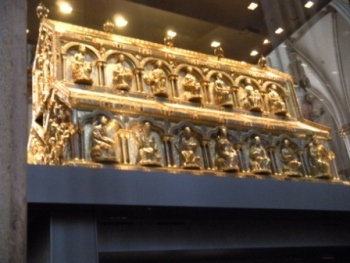 The Cathedral of Cologne, not only has incredibly tall towers, but inside has a coffin holding the remains of the Three Wise Men. Obergärige Hausbrauerei Päffgen, Friesenstr. 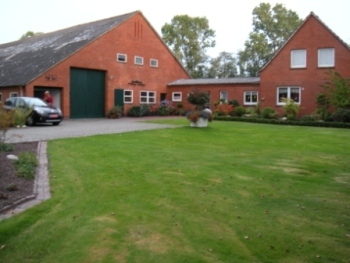 64-66 - Tel. 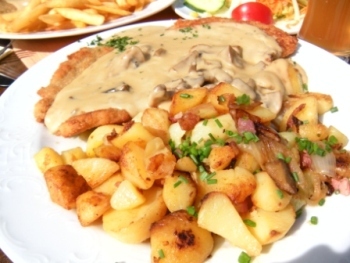 02 21/ 13 54 61 - wonderful atmosphere in an old brauhaus, locals only, great food and low prices! 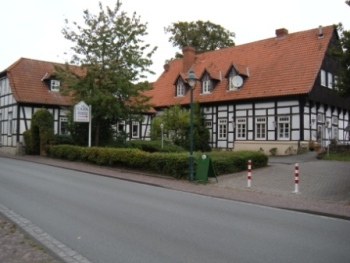 Engelbrecht's Bauernhof - garage and barn to the left and home at center and right - was a great place to stay. 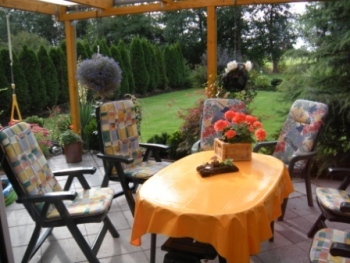 The owners provided a huge breakfast each morning and invited us for schnapps, wine and kuchen in the evening. where Vicki's mother's family lived in the early 1800s before they came to America. Read more about our family search in our BLAB. 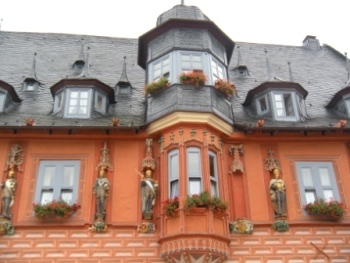 at the foot of the Harz Mountains. 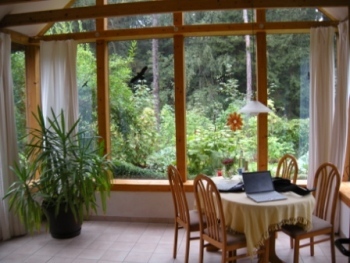 Our holiday house in Goslar was a cute little cottage with a garden room looking out into the forest. 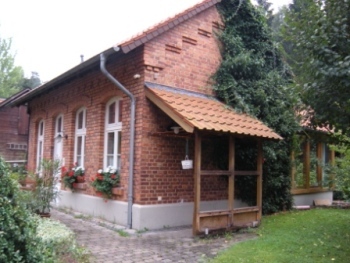 The name of the cottage was the Altes Waschhaus (the Old Wash House). and grilled potatoes we have been eating. 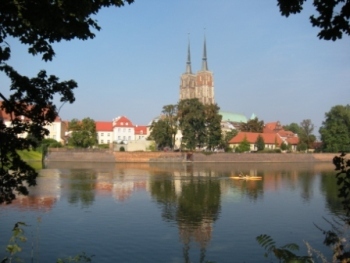 The highway from Germany to Wroclaw (pronounced VROTS-wahv) was one of the most modern we had ever driven. Digital signs gave air and road temperatures and flashed speed limits. 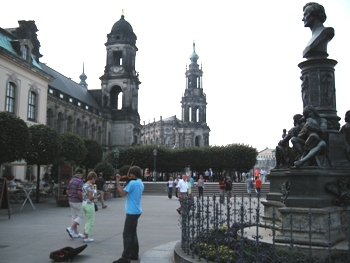 The beautiful city center looked more like Amsterdam than Russia; but the surrounding area was bleak with grey, concrete apartment buildings. 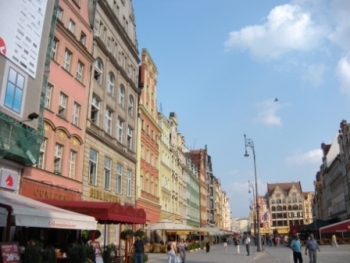 Happily, our dollar is strong against the Polish zlotych (zwah-tee) and meals in most restaurants are under $10.00 per person. 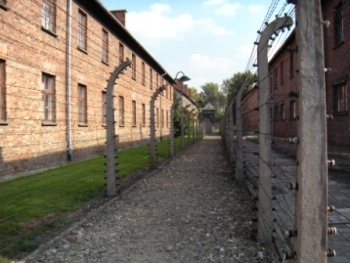 We spent a somber 3 1/2 hours on a guided tour of the Auchwitz & Birkenau concentration camps. 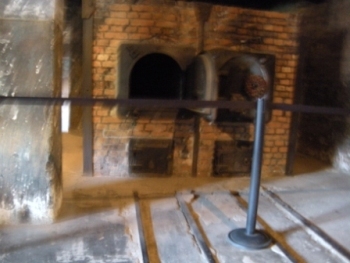 It was so sad to see the incinerators where so many people were cremated after their execution. 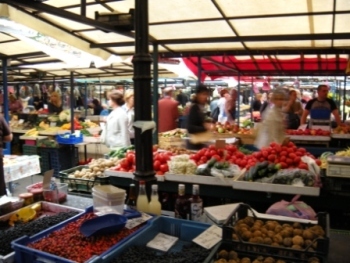 Krakow has a huge market under a canopy that sells food, clothes and about anything else. 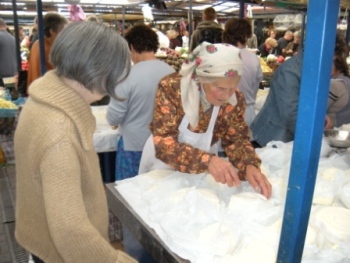 Farmers cut and sell their fresh cheese. 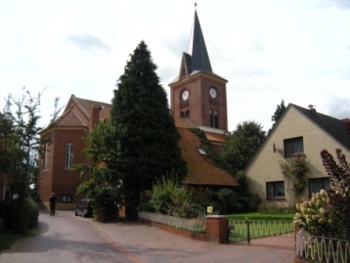 The church in the Main Square plays a trumpeters song each hour on the hour, but half way through the melody it cuts off abruptly. This is to commemorate a bugler who saved the city in 1241 by warning them of the invading Tartars, but was killed in the attempt. 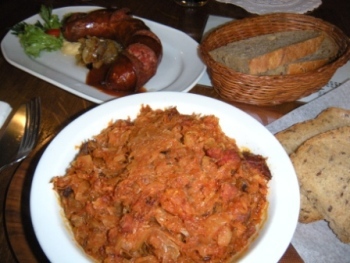 (a combination of cabbage, sausage and mushrooms). Put me in the camp of "love it!". 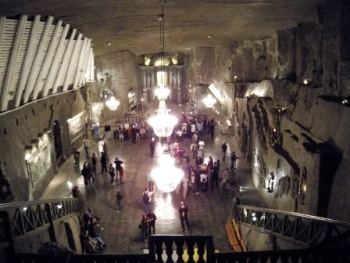 A 40 minute bus ride from Krakow (for $1.07 USD) takes you to the Wieliczka Salt Mine. 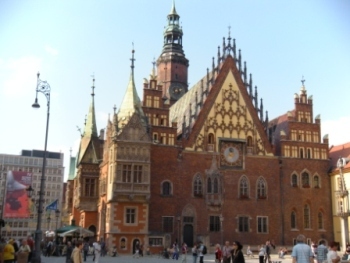 We walked 130 meters (42 stories below ground) to the St. Kinga's Chapel where the ceiling, floors and chandeliers are made of salt. 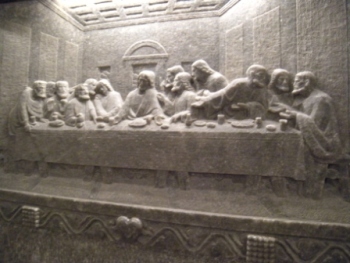 The walls are decorated in bas relief carvings depicting scenes from the Bible. 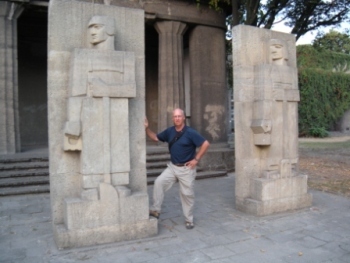 The tour, which lasts 2 1/2 hours takes you to an underground salt lake, plus a maze of chambers and sculptures. all included for the great price of $35.90 per night!! 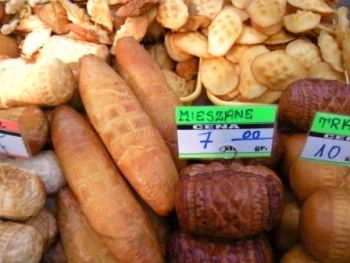 The Zakopane region is famous for their smoked artisan sheep cheese, oscypek. 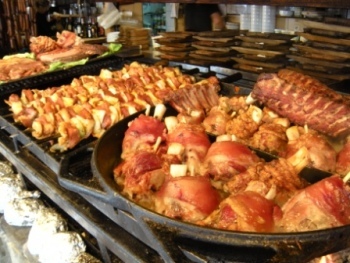 In the city Zakopane there are a ton of great restaurants with fun atmospheres that serve huge slabs of grilled ribs and delicious pork knuckles. 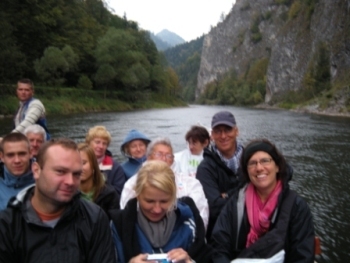 We took a rafting trip through the Dunajec Gorge in a raft that was actually 5 canoes strapped together. The seats just sat unattached on top of the sides. The front was "padded" with pine branches instead of rubber bumpers. 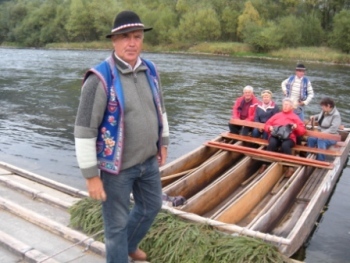 For two hours our guide worked us down the river that is part of the Pieninski National Park with Slovakia on the right bank and Poland on the left. but became cloudy and dropped into the 50s. 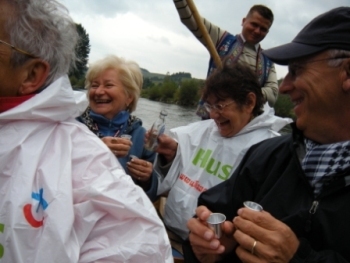 Our new Polish friends were ready for the cold weather and broke out their full set of travel shot glasses. Each of us was treated to Vodka shots. Watra, ul. 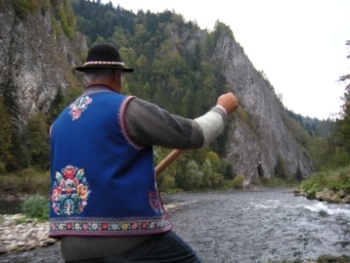 Zamoyskiego 2, Zakopane - tel. 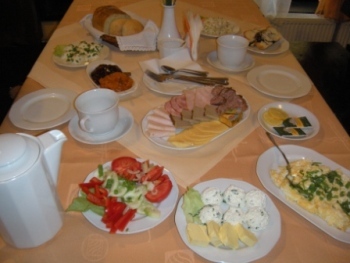 0 512 351 742 - great grilled meats, salad bar, fun atmosphere, heavy wooden picnic tables, food served on wooden boards, servers dressed in Highlander traditional costumes.